LUCKNOW, India — Parents of at least 35 children who have died in a hospital in northern India over the past three days say the fatalities were due to the lack of oxygen supply in the children's ward. District Magistrate Rajiv Rautela said Saturday that the deaths of the children being treated for different ailments at the Baba Raghav Das Medical College Hospital in Gorakhpur city in Uttar Pradesh state were due to natural causes. He denied that a lack of oxygen led to their deaths. Parents said that the oxygen supply to the ward ran out Thursday night and that patients' families were given self-inflating bags to help the children breathe. "That's the time when the death of the children peaked," said Mritunjaya Singh, whose 7-month-old son was admitted to the hospital and was not among the dead. The Uttar Pradesh government has ordered an investigation. Prashant Trivedi, the state's top health official, acknowledged that there was a problem in the pipeline supplying oxygen. "But the situation was managed through oxygen cylinders," Trivedi said. "The hospital administration has enough supply of cylinders in its stock. So the report about death of children because of oxygen issue is false." The parents said the company that supplies oxygen to the hospital had earlier threatened to stop oxygen distribution unless the government paid its long-overdue bills. Rautela said that the hospital owed 6.8 million rupees ($106,000) to the company, but added that it had adequate numbers of oxygen cylinders. The federal health ministry sent a team of specialists to the hospital to verify what caused the fatalities at the facility, which provides health care to a vast swath of Uttar Pradesh and neighboring Bihar state. Meanwhile, opposition leaders took to social media to blame Prime Minister Narendra Modi's Bharatiya Janata Party, which rules the state, for its neglect and indifference to people's health. Opposition Congress Party Vice President Rahul Gandhi tweeted: "Deeply pained. My thoughts are with the families of the victims. BJP govt. is responsible & should punish the negligent who caused this tragedy." Some of the children had been treated for encephalitis, a disease that preys on the young and malnourished and is rampant in the state during the monsoon season, which runs from June till September. The hospital, which has become a major center for children with encephalitis, has treated nearly 370 cases in the last two months. 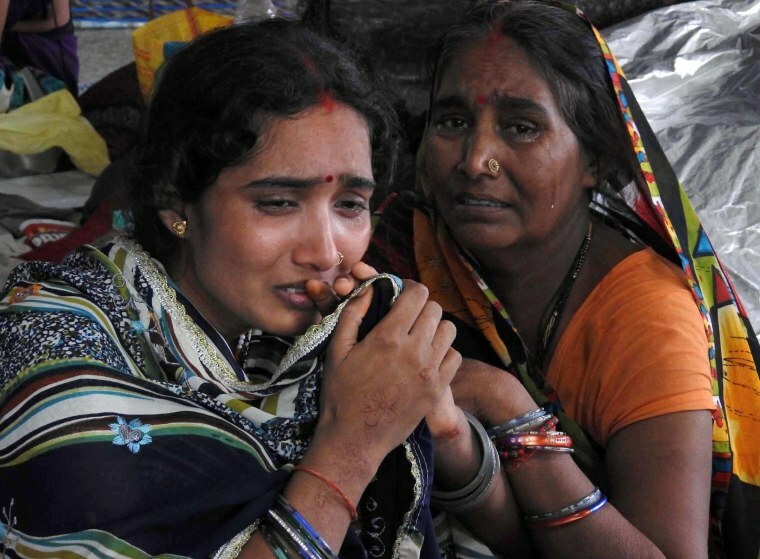 Of these, 129 children died, said Satish Chandra, a hospital spokesman. Gorakhpur is located 185 miles southeast of the state capital, Lucknow. Parents of at least 35 children who have died in a hospital in northern India over the past three days have alleged that the fatalities were due to the lack of oxygen supply in the children's ward.